There are almost countless ancient sites that align to the winter solstice—just a few of these are included here. They have encapsulated a profound esoteric wisdom that can still be grasped even in our modern world—outlasting books and texts, which are easily lost and destroyed. These monuments speak to us through thousands of years about the true spiritual significance of the winter solstice. Someone who understands the symbolic language used to build these sites can see the builders knew the winter solstice was the cosmic embodiment of the process of creation and the birth of the divine Son. The significance of the birth of divinity pre-dates Christian times, which reveals that spiritual deities born at the winter solstice, such as Jesus, Horus, Krishna, Dionysus, Attis, Mithras, etc., symbolize something much greater which no religion owns exclusively. These sites were built around the universal knowledge of the process of awakening in which the birth of the divine Son within a spiritually prepared individual is a central event. 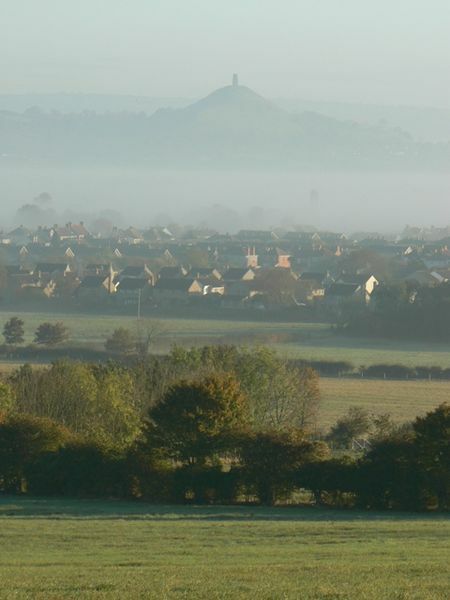 Glastonbury Tor rising out of the mist (photo CC BY-SA 2.0 by Edwin Graham). This ancient site is undated and unexcavated, and is believed by many to be the mysterious Isle of Avalon from the legend of King Arthur. It is a giant man-made seven-terraced mound, which was once surrounded by water. Today it is topped by a church tower, which was built in place of a much earlier site. From what appears to be an ancient man-made observation mound on nearby Windmill Hill, someone can watch the winter solstice sun appear at the bottom of the terraces of Glastonbury Tor, and “roll” up the northern side of the terraces until clipping the top of the tower. In approximately 3,000 BC, only the top rim of the sun would have been visible, allowing someone to observe this incredible event without being blinded by the sun’s light. The constellation Orion rises over the Tor in the winter months, followed by the star Sirius, which rises soon after. During the period around 3,150 BC, Sirius rose in the same place as the winter solstice sun. Orion is associated with the Egyptian father god Osiris, and Sirius is associated with his wife, the Egyptian mother goddess Isis. Horus, their son, is associated with the sun, and is born at the winter solstice. Thus at Glastonbury Tor, during the winter solstice someone could witness a cosmic nativity of Father, Mother, and Son, along with the symbolism created by the Tor (discussed in The Spiritual Meaning of the Winter Solstice). The rising sun on the winter solstice connected with the birth of the divine Son at the base of the terraces, is a symbol of the spiritual Son, which is born in the darkness of the earth (matter), from where it rises through the terraces to reach resurrection. This same design has been used at the next site, which is found in a very different part of the world. The pyramid of the feathered serpent (which is a symbol of the union of the earthly and heavenly) at Chichen Itza (photo CC BY-SA 4.0 by Claude Belair). 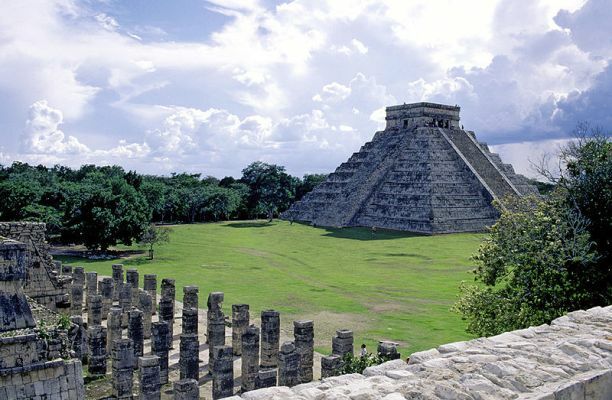 At an ancient Maya sacred site, called Chichen Itza, there is a pyramid dedicated to Kukulcán, the feathered serpent. On the winter solstice the interaction between the sun and the temple is very similar to that of Glastonbury Tor. When one stands looking at the western face of the pyramid, the sun appears to climb up the terraces until it rests momentarily directly above the pyramid on the pinnacle of the temple room that sits on top of the pyramid. Like Glastonbury, it enacts the same theme of the sun being born at the lowest level of the mound or pyramid, before rising to crown its tower and peak. Here at Chichen Itza, the divine Son—who is born at the base of the nine terraces, symbolizing the nine regions of the psyche, underworld, and heavens—will gradually grow and ascend through them until he resurrects. A diagram of Goseck circle from above. 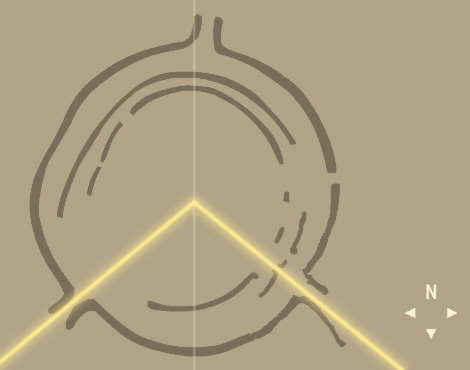 The two yellow lines show the alignment of the winter solstice sunrise and sunset through openings in the circle to reach its center. The Goseck circle is an ancient Neolithic henge, and lies on the same latitude as Stonehenge. Like Stonehenge, it too had prominent solar alignments to the solstices. It is dated to 5,000 BC and was a series of concentric circles constructed out of wooden posts and ditches. Two of the openings to the circle aligned to the sunrise and sunset on the winter solstice, funneling the rays of sunlight through wooden posts into the center of the circle. 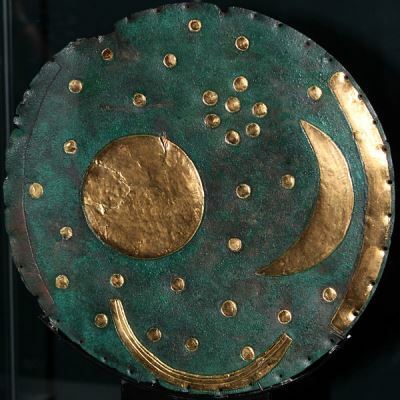 The Nebra Sky Disk. The outer gold rim on the right was also matched by one on the left, which is now missing. These marked the sunsets and sunrises of the winter and summer solstice. The moon and sun are represented in the middle, and are surrounded by stars, which are believed to represent a number of constellations, including possibly the Pleiades (photo CC BY 3.0 by Anagoria). The Nebra Sky Disk is said to be the oldest chart of the heavens in the world. It is dated to 1,600 BC and is made out of bronze with a diagram of the heavens embossed on it in gold, and was made by pre-Celtic people. It was discovered on the hilltop of Mittelberg, which is just twenty-five kilometers away from the location of the Goseck circle above. Like the Goseck circle, it too marks the dates of the solstice, but the Nebra disk is handheld and transportable. Two arcs which run along either side of the Nebra disk mark the sun’s positions at sunrise and sunset on both the winter and summer solstice from Mittelberg hill where it was discovered. Additionally, if the Nebra disk is laid flat on this hilltop and faced north, one of these arcs points to Brocken mountain, the highest peak of the Harz massif. When viewed Mittelberg hill, the sun sets on the summer solstice precisely behind Brocken mountain. This is the Temple of Horus, but the design of the entrance to the Temple of Karnak follows the same architecture, where the front wall is clearly divided in two from which the sun emerges (photo CC BY-SA 3.0 by Steve F-E-Cameron). The Temple of Amun-Ra at Karnak, was known to the ancient Egyptians as the most hallowed of places, and the very center of the world dedicated to the supreme creator god Amun, where he first brought forth creation. Karnak is the largest temple complex in the world, and houses the largest room of any religious building in the world. Its main axis, which runs down the center of this colossal complex, is aligned to the winter solstice sunrise. Construction on it is said to have begun during Egypt’s Middle Kingdom, dated between 2,055–1,650 BC. 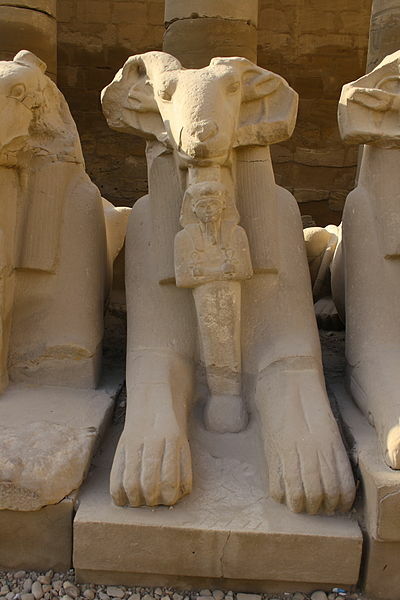 The Goddess Mut has a dedicated temple as part of the Karnak complex, in probably one of the most ancient areas of it. Enclosed in her precinct is a sacred lake in the shape of a crescent, symbolizing the waters of creation and the womb. Here we have the presence of the father god Amun and mother goddess Mut at a temple complex aligned to the winter solstice sunrise, which is the time of the birth of the Son. Pylon architecture was used at Karnak, and was used for the main entrance to the temple complex, which the rising winter solstice sun shone through. A pylon is a huge entrance wall which appears to be divided in two, with a winged solar disk rising in between over the doorway. Pylons were seen as symbols of first creation and of rebirth, which is central to the spiritual meaning of the winter solstice. Pylons depict in architecture the hieroglyph of the sun rising over the horizon between two mountains as it was said to have done on the first day. Ram-headed sphinx at the Temple of Karnak with the figure of a pharaoh between its paws (photo CC BY-SA 3.0 by Hedwig Storch). When the sun rises on the morning of the winter solstice, it aligns to and enters the temple’s most inner sanctuary dedicated to the creator god Amun. 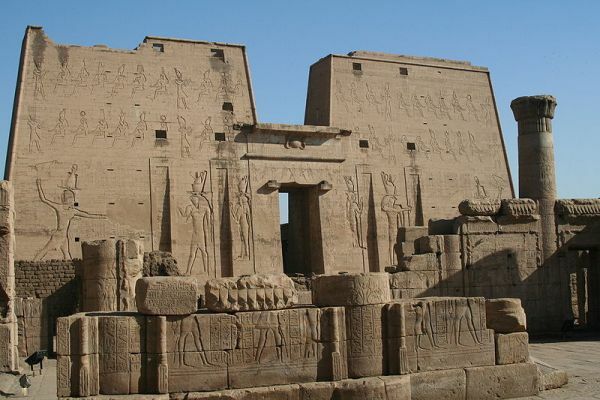 Doors from this sanctuary could be opened to allow the sun’s rays to funnel along the main axis of the massive temple, out through its rear entrance (a pylon) and along a massive causeway lined with ram-headed sphinxes toward the river Nile. The sanctuary of Amun is a small stone room, and is reminiscent of a womb that is penetrated by the creative force to give birth to the divine Son. Interestingly, this sanctuary aligns to the temple of Luxor nearby, which itself is laid to the proportions of a human body. Sometimes called the Temple of Man, the Luxor Temple depicts an annunciation scene in which the God Amun announces to the mother Goddess Mut that she will give birth to a divine child. Both in the Karnak Temple Complex and Luxor Temple the golden number and the Fibonacci sequence are found. These sacred numbers are key to the growth and development of all life. In fact, the Karnak Temple Complex was built upon and expanded over hundreds of years, according to the Fibonacci sequence. The entrance to the complex is flanked by rows of giant ram-headed sphinxes that symbolized Amun, and the Fibonacci sequence can be found in the growth of a ram’s horns, just as it is found in a nautilus’ shell. This temple complex was dedicated to life, its growth, the birth of the Son, and creation—and was specifically aligned to the winter solstice. You can watch a video of the alignment below. Newgrange (photo CC BY-SA 3.0 by Shira). 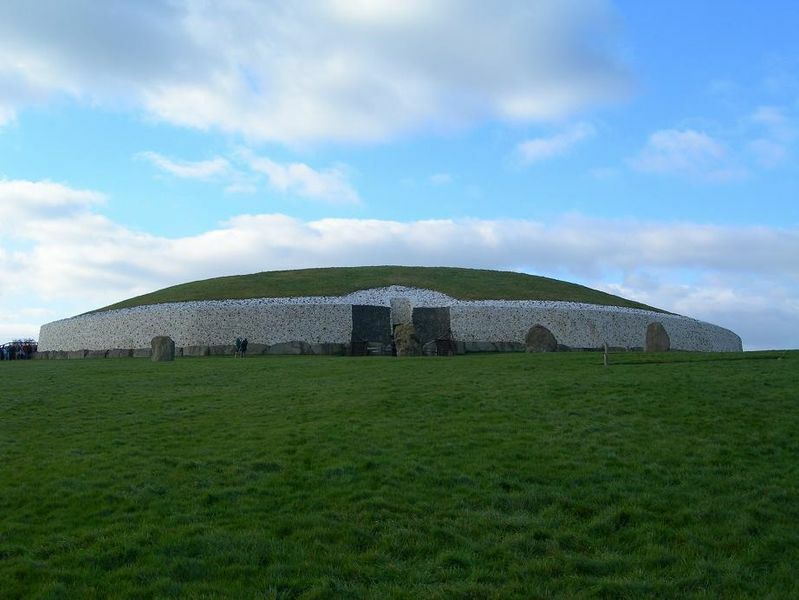 Newgrange is a giant one acre mound, and grass-topped temple, said to have been built around 3,200 BC. Once a year, at the winter solstice, the rising sun enters the mound through a specially built roofbox above the main entrance and shines directly along the nineteen meter long passage, gradually widening until illuminating the inner chamber for about seventeen minutes. Today the first light enters about four minutes after sunrise, but calculations based on the precession of the earth show that five thousand years ago the first light would have entered exactly at sunrise. The inner chamber of the mound is laid out in the shape of a cross, and beautiful neolithic artwork can be found etched into the stone both on the inside and outside of the mound. Particularly prevalent are spiral designs, including the famous tri-spiral design found inside the chamber. This site has photos of the artwork inside the chamber. Here the symbol of the cross appears in connection with the winter solstice, the time of the birth of the divine Son, long before the birth of Jesus. The cross represents the crossing of male and female forces, which give birth to all life. The tri-spiral symbol also shows the union of the three forces of Father, Mother, and Son—positive, negative, and neutral, which give rise to creation. The single spiral is often referred to as “the spiral of life” as it shows the expansion of life. The mound itself appears to be like a great womb of the earth. Just as the birth of Jesus, Mithras, and Viracocha was said to have taken place in a cave, so too at Newgrange the birth of the sun is enacted inside the dark chamber of the mound. 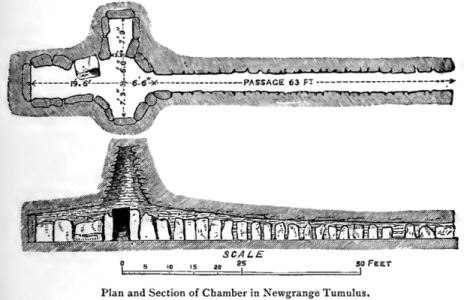 Maeshowe, a similarly built and designed mound north of Scotland on the Orkney Islands, also receives a beam of sunlight to its central chamber on the winter solstice. A lone moai statue in the center of Easter Island, at a site called Ahu Huri A Urenga, faces the rising sun on the winter solstice. Unlike any other statue on the island, it has four hands instead of the usual two. This appears to be no coincidence, as the number four has a symbolic meaning related to the sun and the process of creation. This moai is seen as one of the most important astronomical observatories on the island, as it appears that the altar together with five cupules etched on a nearby rock functioned as a “solar-ranging device” which marked the winter solstice and possibly the equinoxes. This is about 1/4 of the chapter on the ancient sites aligned to the winter solstice. Keep reading in the book The Path of the Spiritual Sun, available at Amazon.com, Amazon.co.uk, Bookdepository.com and other online book retailers.